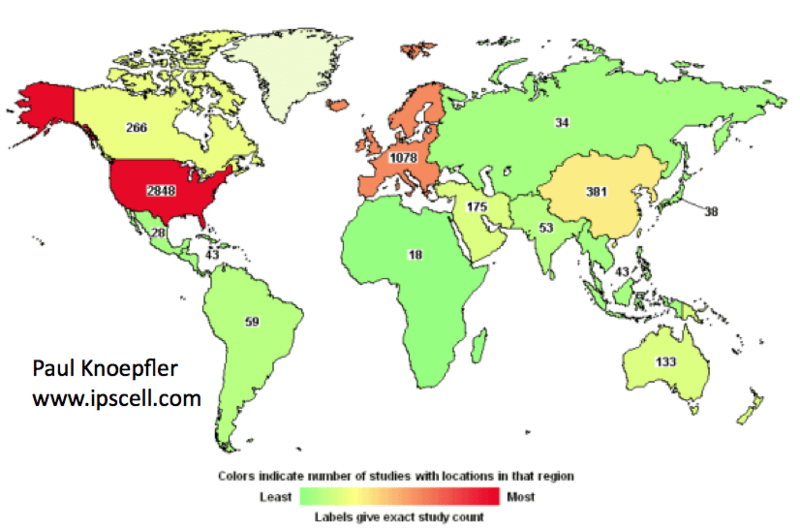 Total Stem Cell Clinical TrialsLate in 2012 I did a piece on the global trends in stem cell clinical trials. It is time for an update. Another look at stem cell clinical trials now (late Sept. 2013) based on the clinicaltrials.gov database shows an encouraging trend. The total number of stem cell clinical trials registered in the database has risen in the last 10 months or so from 4,316 to 4,775, a 10.6% increase. 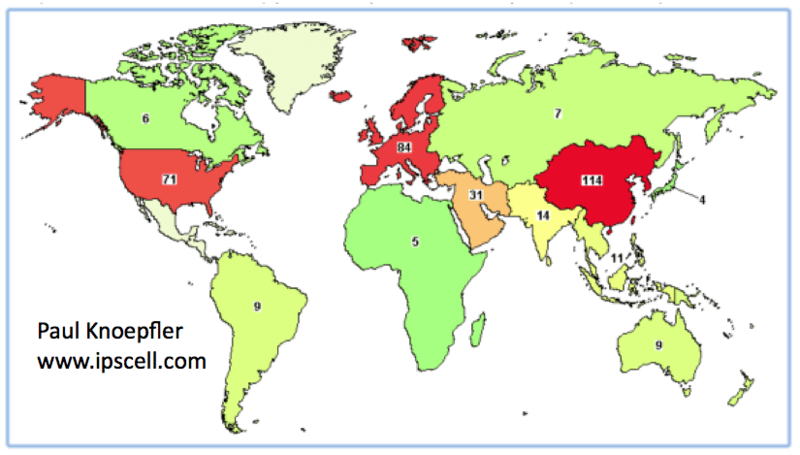 The U.S. continues to dominate total stem cell clinical trial numbers (see map above). It is unclear whether some of this could be an inherent bias of the clinicaltrials.gov registry to be underutilized by non-American clinical trial coordinators. The European Union (EU) is a strong second followed by China, Canada, the Middle East region, and Australia. The number of mesenchymal stem cell (MSC) clinical trials rose from 281 to 354, a whopping 26% increase (see map immediately above). This suggests that the rate of growth of MSC trials is substantially faster than that of stem cells overall. Here the geographic trends are quite different with China leading the way, then the EU, and the U.S. in third followed by the Middle East region. Some of this difference in geography as compared to total stem cell clinical trial numbers could reflect variable regulatory approaches in countries and regions. The geographic proportions today are roughly the same as they were last year. What we do not know that would be extremely important for context is how many non-clinical trial-based stem cell treatments are being given across the globe as well as in specific countries and regions. I believe, however, it is reasonable to predict that there are vastly more patients being given stem cell interventions outside of clinical trials than within the context of clinical trials. Step 3: Overlap a text box on the map and type in your branding, choosing font size, style, color, etc. Nice maps, Paul; thanks! A quick note on methodology: searching ClinicalTrials.org for the key words “stem cells” will mostly turn up trials that are NOT clinical trials of stem cells, as was shown by Alexey Bersenev in his presentation at ISCT-NA 2013 in Philadelphia (“How to Mine the Data of Cell Therapy Clinical Trials”). As many folks who attempt this sort of search quickly discover, the vast majority of the trial records returned by a search on “stem cells” are trials involving, but not testing, bone marrow transplants after myeloablative conditioning (something else, usually a small molecule, is what’s being tested in most such trials). These records turn up because a weakness of ClinicalTrials is that it does not employ a controlled vocabulary nor does it tag trials by cell type; every record returned by searching on “stem cells” is a record in which the author happened to use the words ‘stem’ and ‘cells’ somewhere in the text…which does not a stem cell trial make. So I’m inclined to believe your map for “mesenchymal stem cells” as a first approximation, but the numbers on the map for “stem cells” aren’t right at all. Thanks, Bill. I probably should have include a sentence or two about the limitations of such searches. Do you have any suggestions for how to get more precise data on this? Unfortunately it’s not easy, because ClinicalTrials.org wasn’t designed to support this sort of query. It can be done, though, with a combination of manual curation (read all the returned records and select just the ones that actually involve stem cell trials), automated processes (text mining), and elbow grease. I recently discussed in detail the way we approached the task here (I hope this link works…not sure whether your blog allows anchor tags in comments). I know of clinicaltrials.gov, I can’t seem to find the clinicaltrials.org that you mention. Is this a different website? I think so many would like to participate in stem cells clinical trials because of the possible good effect it can give.